Ogunquit feels like it is in the middle of it all, a perfect home port for your vacation. The village of Ogunquit presents the Nautical Life. Visitors are invited to enjoy our quintessential Maine beachside village and its sandy front row seat on the magnificent Atlantic Ocean. No matter what it is you want to do or experience, you can walk to it in Ogunquit. From surfing, sailing, or fishing to swimming, kayaking, or stand-up paddleboarding (SUP)—the choice is yours. You can even take time to simply relax by the sea watching the waves roll in or survey the daily catch being hauled in by our fishermen at the town dock in Perkins Cove. When you come, plan on spending at least a few days here to be certain that you will be able to enjoy all there is to do and see. Unpack once and enjoy your entire vacation from right here. 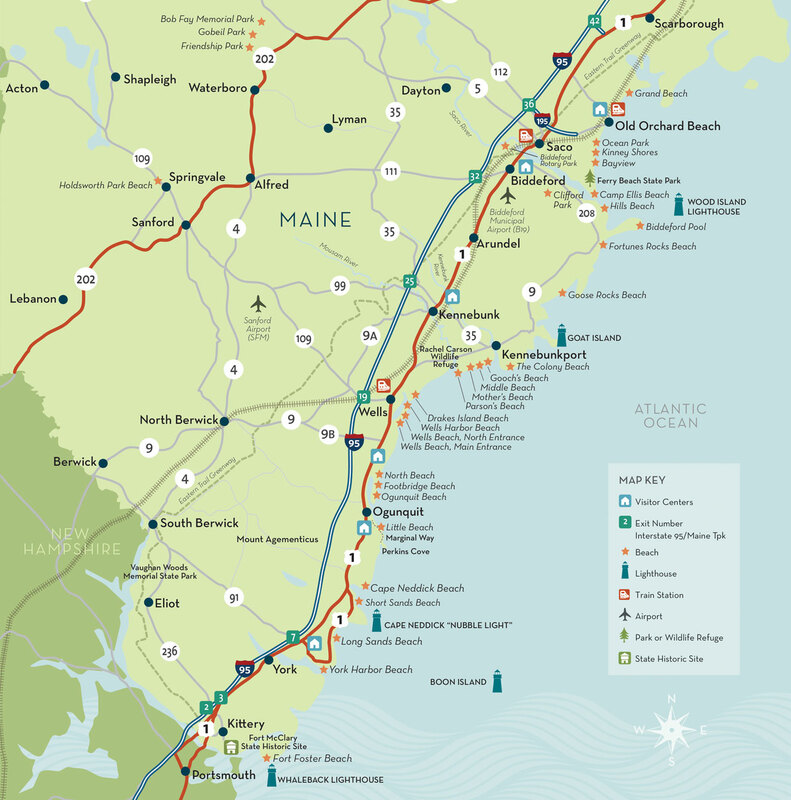 Our innkeepers and hoteliers will happily help you plan your entire Maine Beaches vacation, from daily activities and shopping trips to some of Maine’s finest nightly entertainment. And who could forget dining out on what is arguably the world’s best lobster or on today’s catch prepared to perfection? From Ogunquit you can breeze back and forth into other Maine beach towns with ease or even take adventures further afield if you like, knowing that your GPS or smartphone will quickly guide you home to your cozy Ogunquit room each night. With so many adventures and a central location, Ogunquit is the perfect Maine port of call. From a tasty beachside treat to the finest in white tablecloth dining, it’s all yours in Ogunquit. Select from some of the sweetest little B&Bs and inns or relax in style at Maine’s grand hotels and resorts. Without question, Ogunquit will meet the dining and lodging needs of even the most selective guests. During the day we also offer biking and walking trails—including the spectacular views from along The Marginal Way. Shopping, antiquing, browsing, or just taking time relaxing—the choice is all yours. At night, our village is just walking distance to galleries, live theater, music, and nightlife. When you arrive be sure to pick up a copy of This Week in Ogunquit at your hotel for the most up-to-date schedule of things happening in and around town. For more information or to plan your next Ogunquit getaway, contact the Ogunquit Chamber of Commerce at (207) 646-2939 or visit us at Ogunquit.org.